Clear communication is the key to success in any project and effective management is the cornerstone to smart business. Progress reports provide efficient goal-management to ensure steady progress. 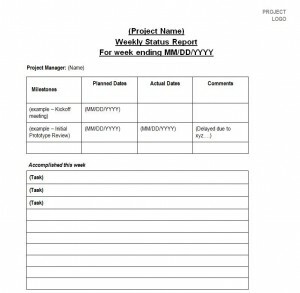 Microsoft Word’s Weekly Status Checklist is the ideal template for project communications. Weekly status checklists save management time while concisely focusing on the strengths and weaknesses of team members. This template is exceedingly user-friendly and can be downloaded for free on this page, offering an easy opportunity to restructure goals and deadlines. Begin with customizing the template, adding the project name and relevant dates. Adding a project logo to the template is not only simple, but sets up a personalized, professional form. Columns and rows can be added or deleted depending on the details that should be included, such as budget use and hours dedicated. Be sure to save this format. As the project progresses, the customizable format can easily be adjusted to reflect accomplished tasks and set goals for the upcoming week. As the project develops, the clear-cut layout of the template will highlight successes and pitfalls, such as meeting deadlines or budget management. Be sure to save each checklist as a reference for progress, and a means of concentrating on team strengths and weaknesses to allow for regularity and prevent falling behind. The weekly status checklist will help to set a more effective pace as time goes on. Progression may lead to different priorities. Make sure the template is kept up to date to reflect new goals and expectations, such as adding new columns for final dates, or rows for the finishing details. When the projected deadline begins to approach, it is important to emphasize certain aspects that may still need work by highlighting them in the weekly status checklist. Features such as the highlighting tool, or using red ink, will draw attention to the issues that require greater focus. Project management requires a substantial amount of attention to detail. Sustaining communication, offering feedback, and staying on top of progress is made easy by using the weekly status checklist template by Word, available for free download on this page.